Low pressure is anything under 10,000 psi (69 MPa). Medium pressure is between 10,000 and 15,000 psi (69 to 103 MPa). High pressure is between 15,000 to 40,000 psi (103 to 276 MPa). Ultrahigh-pressure is between 40,000 psi to 75,000 psi (276 to 517 MPa), for waterjet cutting most pumps are between 55-60,000 psi (379 to 413 MPa). HyperPressureTM is anything above 75,000 psi (above 517 MPa). The linear intensifier pump is the original, and most common, technology used in waterjet cutting. Intensifier pumps use the elegant “intensification principle” to pressurize the water. Let’s take a look at how this theory works. Hydraulic oil is pressurized to a pressure of 3,000 psi (in this example). The low pressure oil pushes against a piston biscuit, which has a face area 20 times greater than the face of the high pressure plunger that pushes against the water. Therefore, the 3,000 psi oil pressure is “intensified” twenty times, yielding 60,000 psi water pressure. The “intensification principle”, or ratio, uses the difference in biscuit/plunger area to intensify, or increase the pressure. An electric motor between 25 to 200 hp (18 to 150 kW). The most common is 50hp (37 kW) for waterjet cutting applications. A hydraulic pump attached to the motor, which sends the hydraulic oil to the intensifier. An intensifier, which uses the intensification principle (explained above) to transfer the power of the oil to the water. An inlet water treatment to prepare the ordinary tap water for the pump. A control system to control the pump start/stop, water pressure output, and monitor pump integrity via sensors. The rotary direct drive style pump was first used in field applications of paint removal, mining, and industrial cleaning. Direct drive pumps are used on about 20% of waterjet systems installed worldwide. This pump technology is also used for both factory cutting and field cleaning applications today. Unlike intensifier based pumps, the direct drive rotary pump has no hydraulic pump. Sometimes called a triplex pump, the electric motor rotates a crank with three pistons to generate the ultrahigh-pressure water. If you are familiar at all with a pressure washer used to clean chewing gum off sidewalks or wash down a house before painting, then consider this to be the same type of pump. Direct drive rotary pumps are not yet available at HyperPressure levels – they max out at ultrahigh-pressure (up to 60,000 psi). An electric motor between 25 to 500 hp (18 to 370 kW). The most common is 30 hp (22.4kW) for waterjet cutting applications. A power unit that includes a crank case (often with a gear box) and triplex ultrahigh-pressure fluid end. A true comparison should be left to the experts who sit down with you and review your application. I will just provide a few general high-level opinions. Intensifier pumps are available that can deliver higher pressure than direct drive pumps. 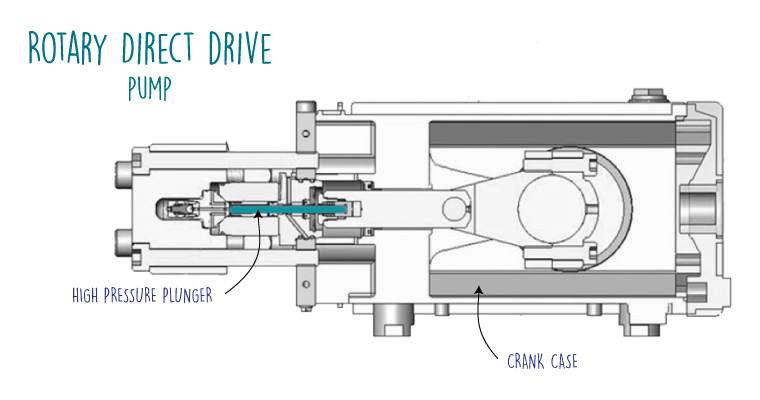 Direct drive is more electrically efficient. Intensifiers have longer maintenance intervals. Direct drives are smaller in size. Intensifiers are better suited for applications where the cutting head will have a lot of on/off cycles. The bottom line is each of these two pump technologies has pros and cons. A pump decision cannot be made by reading this post. Instead, the purpose of this post is to get you grounded in the basics of these pump technologies. When you are ready to look at adding a waterjet, it is best to discuss your particular needs with an expert who has application experience with both types of pump technologies. That is how you will find the right fit for your application and work. In the end I have found that the application dictates the pump, and ultimately your pump decision will be clear to you. Let me know your experience in the comments below, or send me suggestions for future topics.